If then you have been raised with Christ, seek the things that are above, where Christ is, seated at the right hand of God. Set 1 If then you have been raised with Christ, seek the things that are above, where Christ is, seated at the right hand of God. God gave me an open door to share the Good News of Jesus Christ with Tash. There was a sign at the road explaining that this house was the largest recycling project in the country. A woman saw us looking and waved us in. So we stopped, met Elissa, and toured the home that she and her husband have been building for three years. 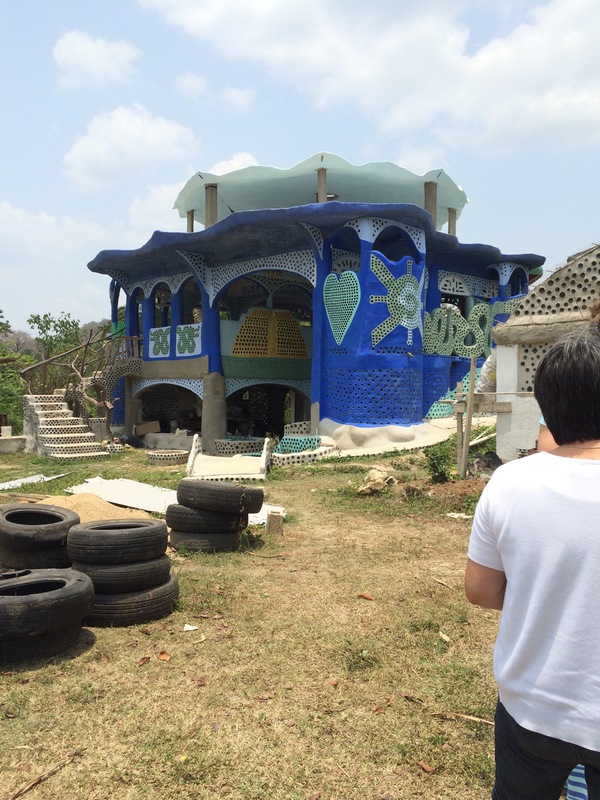 The building is made of garbage: wine bottles, glass coke bottles, plastic bottles and used tires held together by cement. This woman spends hours a day trying to save the planet by artistically reusing the materials others have thrown away. The creativity and ingenuity is truly amazing. Geronimo (our guide) was very kind and gracious. You can tell he loves Mayan history and his ancestors. It was sad to walk among the site, that though was a once magnificent, thriving center of trade, is now reduced to large piles of rubble. (A medical doctor in search of treasure in 1925, blasted multiple monuments with dynamite.😔) But even now you can see to pok-ta-pok courts (a Mayan ball game where the victor had the honor of being a human sacrifice), as well as the altar where sacrifices were made. So many emotions accompany viewing such a place, but mostly a thankfulness that we can we can know the One True God, and be called his children (John 1:12). After visiting the ruins, we went back to the Training Center for lunch, rest and packing. We ate dinner afterwards and the headed to San Antonio to visit Geronimo and Othelia’s church. We had told Othelia that we might visit, but she was certain we wouldn’t come. So when we walked in the door, the smile on her and Geronimo’s faces was priceless. Geronimo promptly announced that someone in our group should bring a message and Othelia came to our seats to ask the ladies to lead in song.😳😊 There was a portion of the service devoted to memory verse recitation- so young and old alike came to the front and shared the verse they had been working- it was so encouraging! Maybe our church should do that! It certainly spoke volumes as to what was important to their church. A young girl took her turn showing the church that she had hidden God’s Word in her heart. Overall, attending the service was a precious time of worshipping with and encouraging the saints. Joe preached the gospel and several responded to receive Christ. Many smiles, handshakes and blessings conclude the service and our time in San Antonio. Today we are in Placencia. We have come to debrief and relax as a team. Praise the Lord, Ben and Nathan seem to be feeling much better. Pastor Bob and his daughter Hannah have also been under the weather, so please keep praying for the health of our team and missionaries. 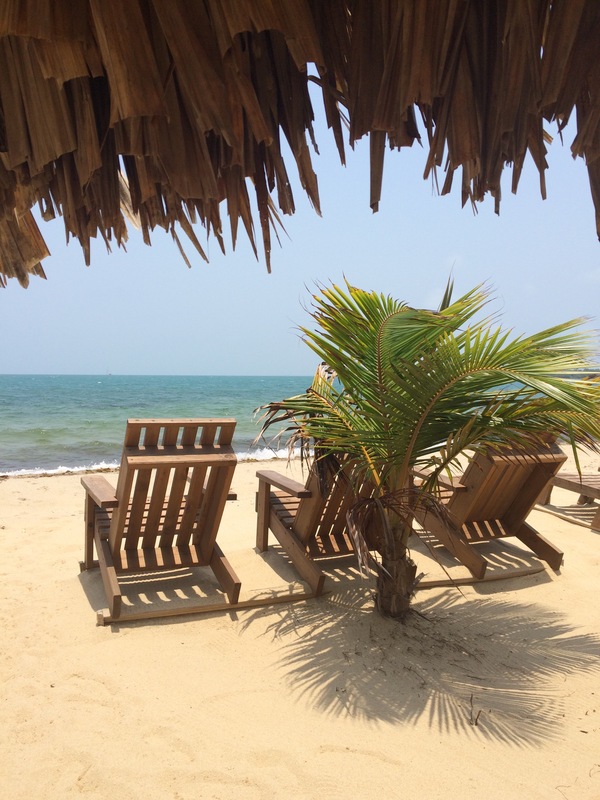 Just a little glimpse of what we are expriencing today in Placencia as we debrief. Doesn’t it look like a postcard?! All in all, this trip has been about investing ourselves in things of eternal value. 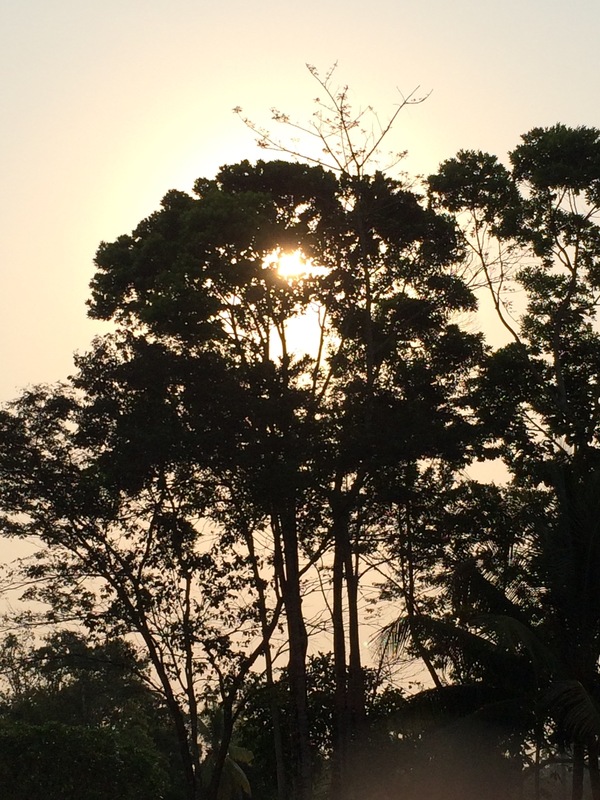 What a joy it has been to endure heat, humidity, and for some, illness, for the sake of the Gospel. 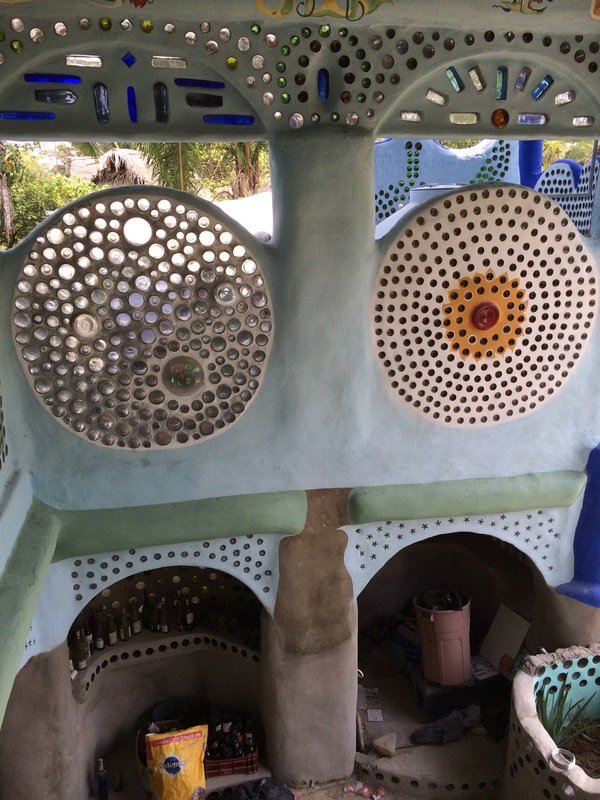 The things of earth are passing away- houses made of bottles, temples made by hands…. but the Word of God will last forever!! Thank you for all of your prayers! We are eternally thankful for our time here and looking forward to being reunited with our children, family and friends! Today we traveled to Boom Creek to visit the students at Living Word elementary school. This was our church’s second time visiting this jungle village of about 100 people. About 40 students attend the school, grades K-8. 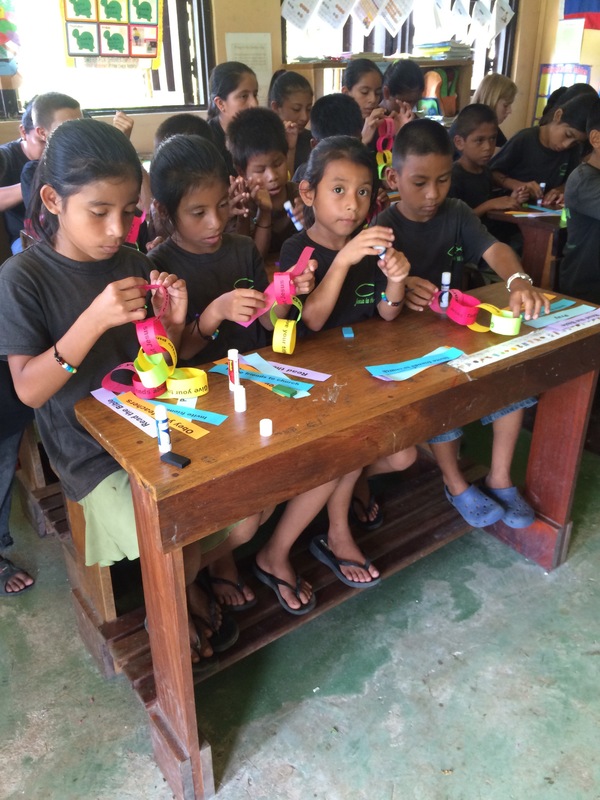 I had so much fun leading the children in making salvation bracelets and teaching them how to share the gospel with others. 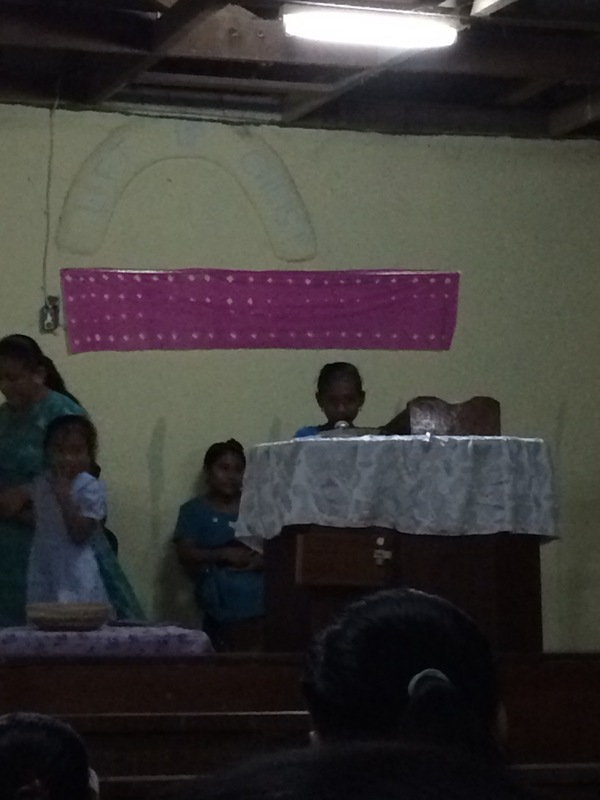 Kendra then led the children in song and telling them the story of Jesus feeding the 5,000. Next, Kelli facilitated a chain activity, walking the children through several Bible passages that instructed how we are to conduct ourselves as Christians. The kids were so attentive- it was delightful to be with them again. While we were at the school, Joe and Ben spent an hour with Andrea and Becky who live in the house next door to the school. They asked all kinds of questions about their lives, learning about the daily happenings of village life: cooking, hunting, fishing, etc. (in Boom Creek there is no electricity because of how remote the village is). Then they prayed with Andrea- it was the high point of Joe’s day. After our school visit, we went to the village church. Together we prayed for revival in Boom Creek and throughout the Toledo District. 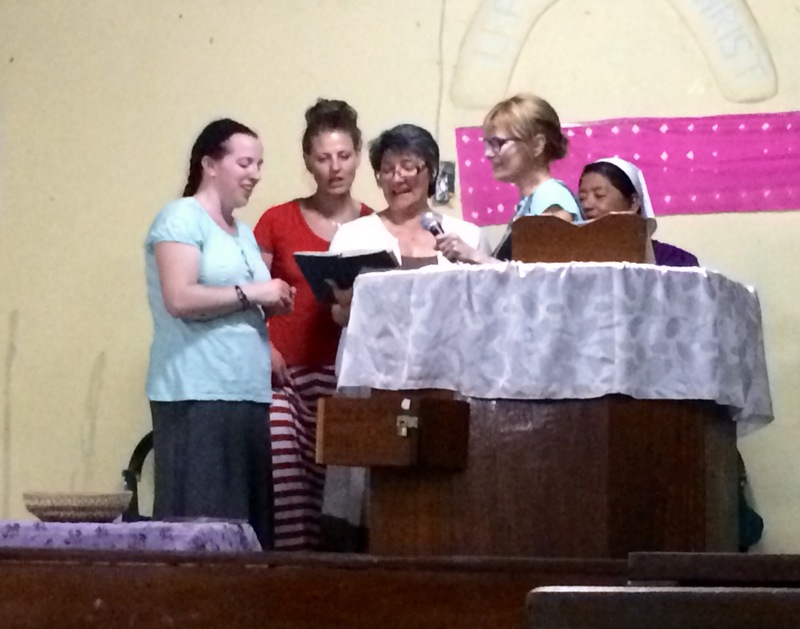 We interceded on behalf of the pastors and teachers we’ve met. It was a sweet time of prayer. Just as we were getting ready to leave, Pastor Santos arrived! We were able to chat with him a bit and lay hands on him and pray. We then traveled back to the Training Center for lunch and a respite from the brutal heat. I think today was the first day the heat really got to me. But all of us felt pretty wilted after being in 95 degrees and 85% humidity with little breeze for most of the morning. The air conditioning was a much appreciated blessing at the Training Center. So after a rest, we headed to Blue Creek for a swim. I hadn’t been there for 15 years- I’m so glad we went today. 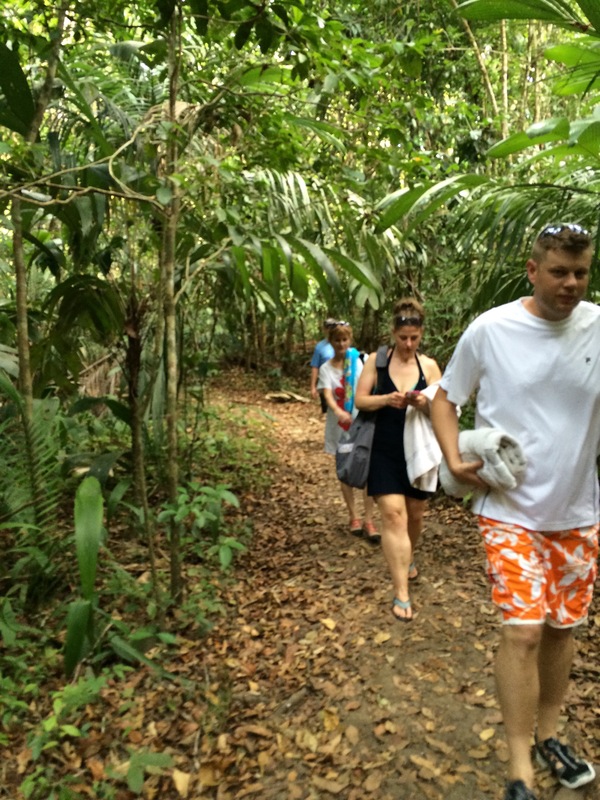 We walked about a mile under the canopy of the jungle to reach Blue Creek. The area is now a popular zip line destination and so a large portion of the trail is rough cement and crushed stone. We had to go beyond the fancy, tiny cottages to reach the cave that is the source to the creek. The water was cool and pristine- the perfect way to cool down after a hot day. 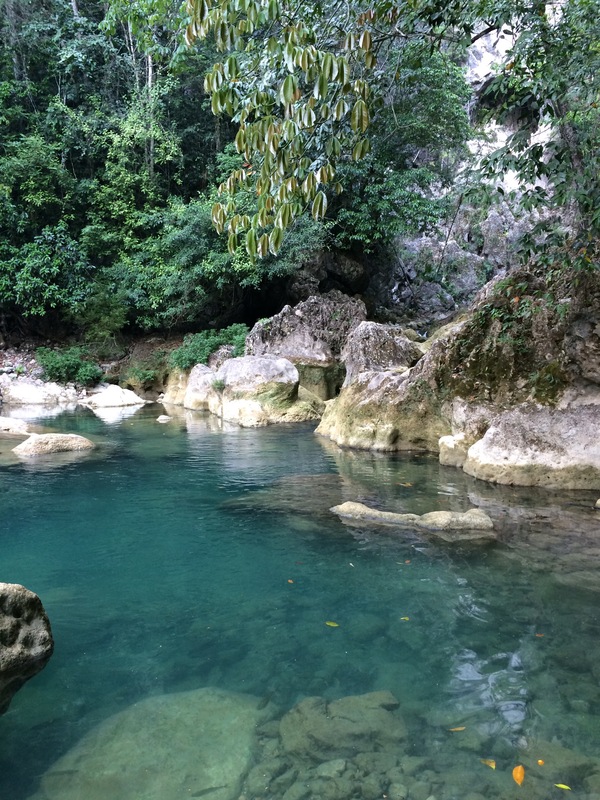 We had a great time swimming over to the waterfall, getting a natural massage under it, climbing up the rocks and jumping back in again. IT was a great time of fellowship and team building as we encouraged each other to try something new and helped each other reach the goal: whether hiking through snake infested jungle, helping a teammate climb up a small waterfall, or jumping into the water from a height. It was a good gift from the Lord. Yesterday was the last session of the Healthy Church Conference. Because the pastors all needed to preach at their respective churches, they could not return on Sunday. As a consequence, our numbers were dramatically smaller. The upside of that was that we got some great one-on-one time with people, allowing us to get to know people better. Today was a lot of fun. It’s probably my favorite day yet. We started off the day leisurely and spent some time debriefing about the Healthy Church Conference: what went well, what did not go well, and what should we change. We had great discussion and, all-in-all, I think our team goes away encouraged about what we see happening here. After our debrief, we set out to find where Pastor Geronimo and his wife Othelia live. They are new acquaintances to Mr. Bob, invited to the weekend’s conference by a friend. Through discussions, Bob became curious and wanted to get to know this pastor more. Though Bob had a vague description, he didn’t know exactly where they lived. So as we drive down the rocky jungle road, we prayed that God would help us find their house. We arrived in town and Bob parked the van in the area described by Geronimo. We then split up to ask the neighbors if they could direct us to the right house, and to share Christ along the way. Kevin, Kendra, Lilia and Nate went into the house right behind where we had parked and immediately Kendra spotted a Bible laying on the counter. She inquired with the young lady at the counter about the Bible, who suspiciously answered it belonged to her Father. Sure enough, Othelia heard their voices from where she was working in the back and laughter and joy ensued. We had parked directly in front of their house!!! Unfortunately, Geronimo was at work and we did not get a chance to visit with him. But we had a wonderful time visiting with Othelia, her expecting daughter, Pamela, and her granddaughter, baby Othelia. It was wonderful to connect with her again after spending the day with her in Saturday. Othelia with her granddaughter, Othelia. 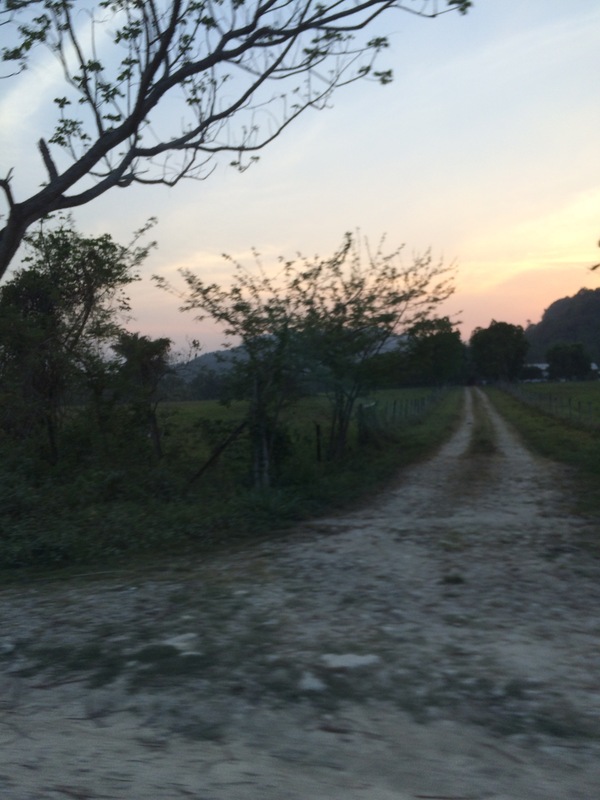 Late in the afternoon we traveled the rocky road to Machaca for a home visit to another pastor, Pastor Santos. Bob has known him a bit longer. Again, we found that Santos was still at work. But his family warmly welcomed us into their homes. Bob Farley (on the left) is standing in front of a series of homes in the village of Machaca. A very fun surprise was that we had seen this family when we were here in October and the children remembered us! We had brought little toys and balloons for the kids, and smiles and lots of hugs ensued. They had been friendly, but guarded in October. But this time they were very free with their affection and enthusiasm to see us. 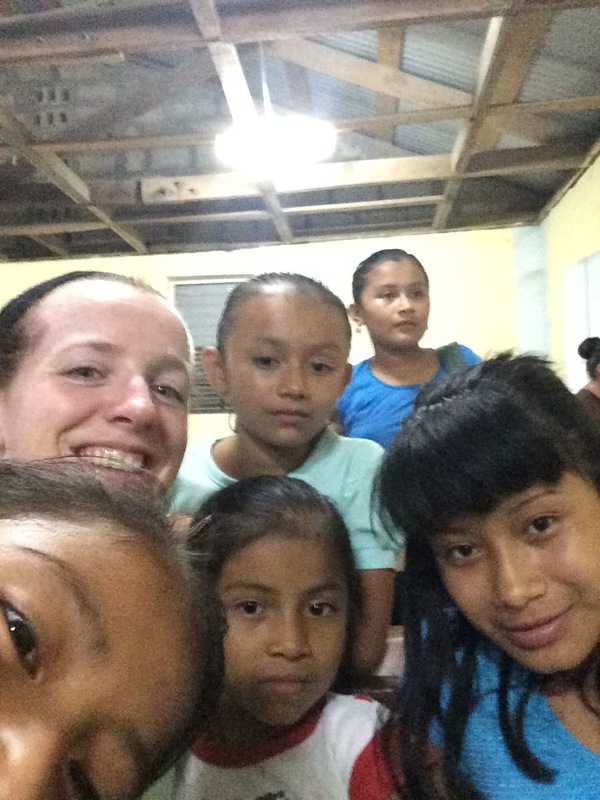 These sweet little girls were not shy about taking a selfie with me. They loved scrolling through my pictures, too. Both adults and children were proud to show us their homes. They made us a cold chocolate coffee drink. And we talked about life in Belize. As the young men started coming home from work, we got to meet Santos’ sons, Samuel and Rolando. Samuel was eager to show us the church and play music for us. He has never been trained on the keys, but he sounded amazing! Samuel was excited to play some songs for us on the keys, and before long, other family members joined in on their instruments, too. I guess what I really loved was seeing these lovely people in their context. At the Training Center we get to talk with people and hear their stories, but visiting them in their homes allows you to see the challenges and beauties of their lives. You take a mental image of their extended family and neighbors with you. It gives you an appreciation for their daily struggles and the simplicity of their lives. In the background is Camp Machaca where I spent the summer of 2001 as a camp counselor. Joe and I had begun dating 2 months before I left for Belize. 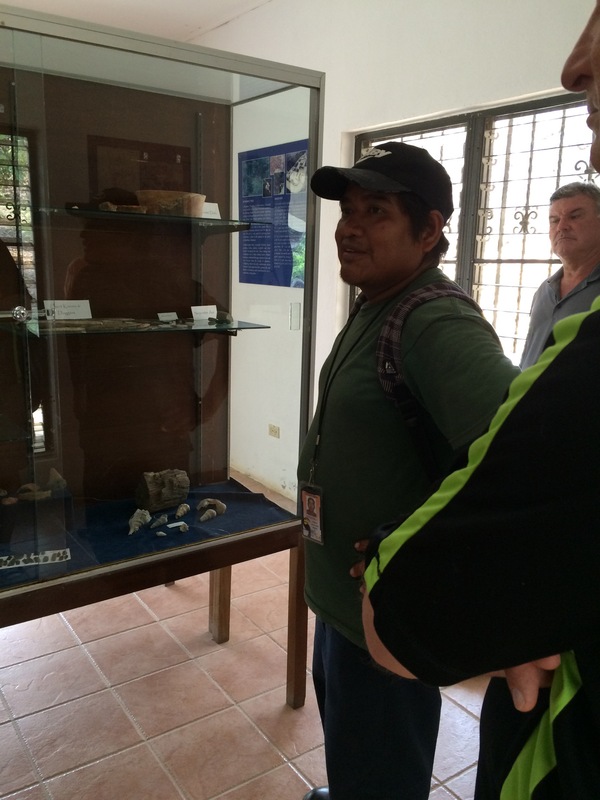 We ended our time by visiting Camp Machaca where my Belize experience began 15 years ago. This is just about a mile up the road from where the Machaca village lies. It was spending a summer here that prompted us to explore if God would have our church partner in ministry with missionaries here. Little did we know that the missionaries God would lead us to partner with live just across the road from where I lived and served so long ago. God has a great sense of humor and a wonderful plan. 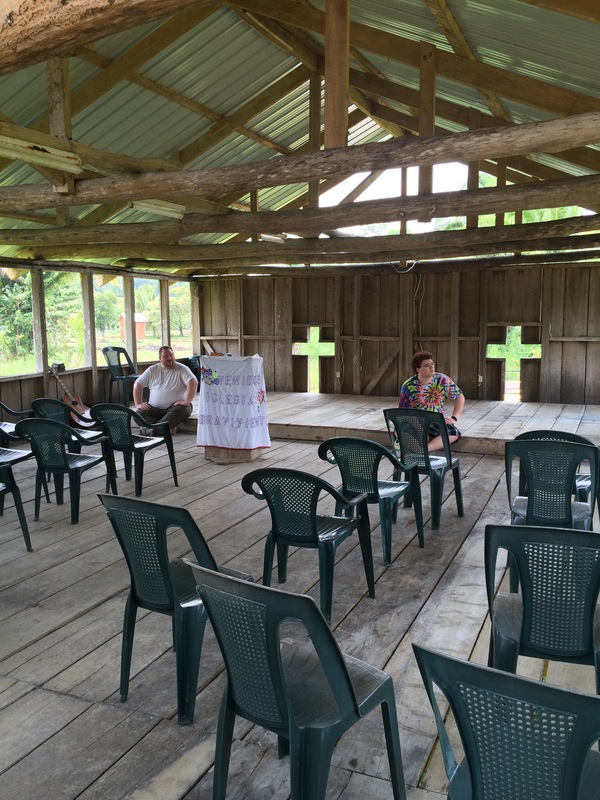 Yesterday the Belize Training Center hosted the first Healthy Church Conference. 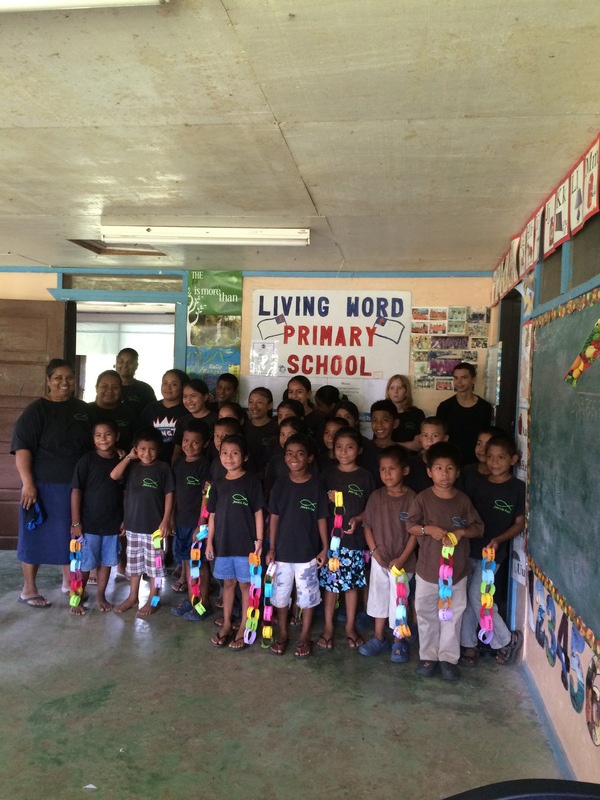 Mr. Bob personally invited many local, indigenous pastors and their families to come. Planning for the event was a challenge because we had no way of knowing how many would attend and what their backgrounds, knowledge level, skills or needs would be. Bob has expressed concern for the church in Belize that seems to be a familiarity with Jesus, but a lack of depth in faith. The conference was planned in hopes that we could come alongside the pastor’s and their families, solidify the foundation of our faith, and help to equip them for the work God has called them to. Our church has been using a curriculum called “Growing in Christ” to teach a new believers class. Our team brought the first part of that curriculum, called “Lessons on Assurance” as the basis for our teaching times. Joe, Bob and Kevin worked with the men. Lilia, Rhonda and I worked with the women. Kendra and Nate worked with the teens. And Kelli and Ben rocked the day with the precious young kids. I really enjoyed the day with these lovely women. Some read, some do not. Some are only months old in their faith, some have been walking with Christ for years. Some have knowledge about spiritual things, but haven’t quite made that heart connection yet. Regardless, they were patient and kind toward one another, respectful of each other’s needs. From what they tell me, that is not a “normal” Beliezean response. For example, there are stories of one farmer having success and his neighbors destroy his crops because if they live in poverty, he must live in poverty, too. This is not the attitude I saw yesterday. These women were filled with the love of Christ for each other. One really exciting part of the day for Joe and I was seeing Peter, who we had met the previous day at the cafe, bring his family to the conference. It was a joy to know that God had appointed our meeting him on Friday with the purpose of bringing him to the conference on Saturday. Below is a picture of Joe and I with Peter, his wife Marta, and five of their six children. The day ended with some relaxed time as team sitting in the shade, cooling in the warm wind. Followed by a delicious dinner at Asha’s, eating seafood over the ocean. I am really loving this time with our team and getting to know these lovely people better. I am blessed. Thank you, Lord. Blessings to you all on this day the Lord has made. Let us all rejoice and be glad in it… together! 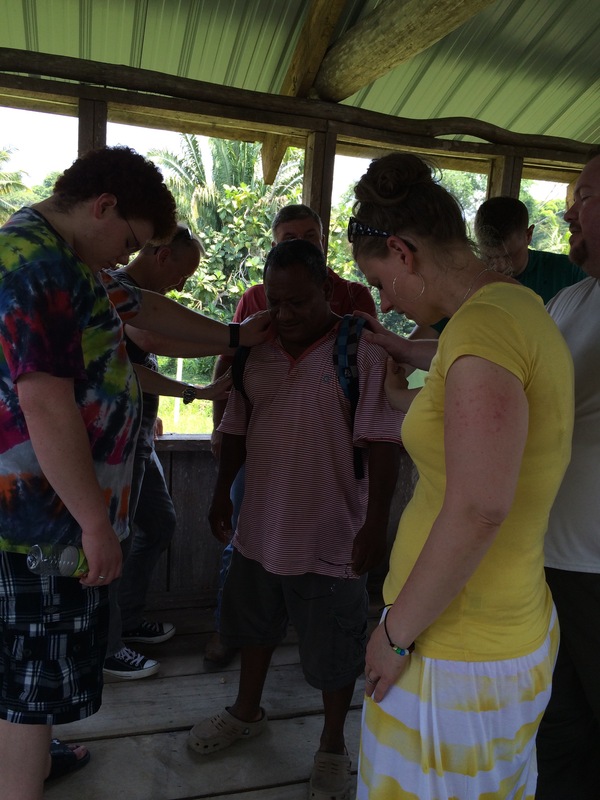 Today was our first full day of ministry in Belize. We started the day leisurely with breakfast at the Training Center, followed by a trip into Punta Gorda for market day. Local vendors come together to sell fruits and vegetables and other homemade wares. Joe challenged the group to look for open doors to encourage the locals and share the gospel and we prayed that it would be so. Once we got into P.G., Joe headed to a local cafe to work on some teaching prep while the rest of the group went to the Cotton Tree Chocolate Factory. I met up with Joe afterwards and shortly after a gentleman approached us trying to sell a stone carving his son made. We weren’t interested, but the man lingered. Without my knowing, Joe recalled his challenge to us and noticed the cross tattoos on the man’s arms. We had a great discussion about faith and were able to discern that this man was indeed following the Lord. We seized the opportunity to invite him to the pastor’s conference tomorrow. We prayed for him and wished him well. Well, another man saw us pray for him and stopped to ask if we were missionaries. He shared much of his life story with us and we were thrilled to learn that he had a past of pastoral ministry and was feeling called to re-enter pastoral ministry once again. We quickly informed him of the pastor’s conference and prayed for him and his cousin. Below is a picture of Joe with Edmund (right) and his cousin Jose. While we were there, Kelli and Kendra witnessed to a gentleman who was grilling meat at the cafe. So it was a purposeful time in town! After lunch we traveled to the village of San Antonio where Ben shared words of encouragement from God’s Word for the students who are preparing to take some big exams. Afterwards we had a couple hours of downtime for teaching prep and rest, followed by Friday night youth group. Approximately 50 youth come to the Training Center for worship, teaching, and fellowship. Kendra brought a great time of teaching through the life experiences of Gideon in the book of Judges. The icing on the cake for me today was reconnecting with Zelda. She was a student that attended Camp Machaca when I was a summer missionary in Belize in 2000. She is now a 7th grade teacher at a local Christian school, wife and mom to a 6yr old boy. She volunteers at Friday night youth group, helping to teach and disciple the kids. It is a blessing to see her still walking with the Lord! So you may be wondering “Where in the world is Belize?” Belize is a tiny country about the size of southeast Wisconsin, just south of the Yucatan peninsula of Mexico. 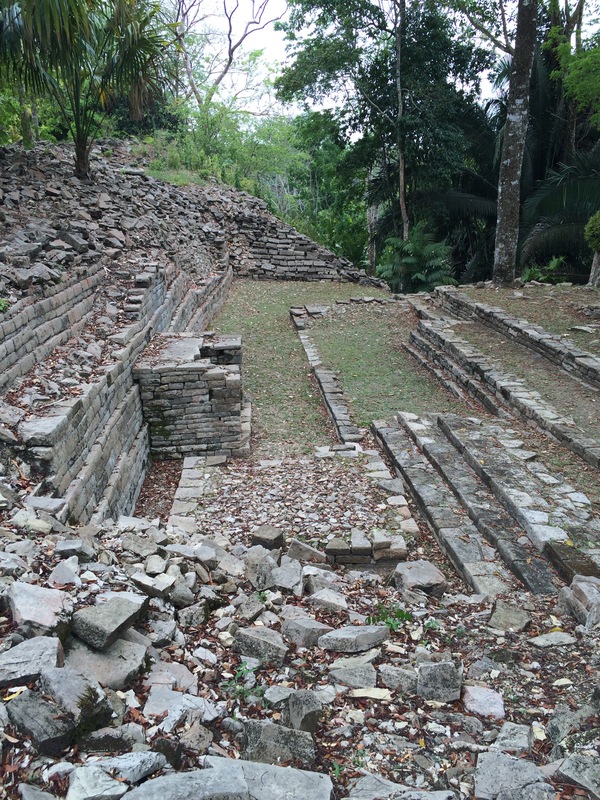 Our team is in the southernmost part of Belize, just north of Guatemala. Our team is staying at the Belize Training Center, just a few miles north of Punta Gorda. And the showers and bathrooms are comfortable, too. We will have youth group and Sunday service in the largest room (seen below), equipped with instruments and sound system, along with brand new air conditioning units! The Training Center is equipped with a lovely kitchen where Miss Bridget prepares our meals. Rice and beans, fry jacks, hamburgers, homemade tortillas, fried chicken…. We eat VERY well here. Bob and Rhonda’s home sits between the Training Center and the Hummingbird Hwy. Below is a view of their lovely home (less than a year old) from the Training Center. 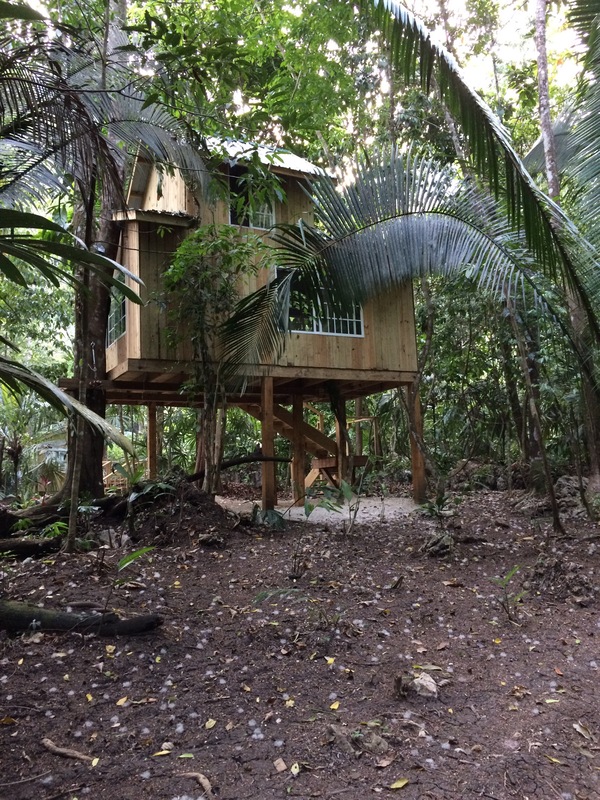 To top it all off, we are surrounded by magnificent views of the surrounding rain forest. We woke up this morning and sat in the shady side of the training center, enjoying the bleating goats, parrots sqwaking, and brilliant sunshine. Thank you, Lord, for this day. The day began at 2:45…..AM!! By 3:20am Kevin and Kendra picked us up and we headed to the airport. We were joined by the rest of the team at the airport by 4:30am and by 6am, we were headed to Atlanta. Praise God! Our travel went very smoothly today- no hiccups whatsoever. It was really fun to watch Kelli and Ben see Belize from the plane for the first time. Once we arrived in Belize, we jumped onto a small puddle jumper , 12 seat plane from Belize City and flew to Punta Gorda- the nearest city to the Belize Training Center. The ride was a little bumpy upon take off and landing because of the high winds today, but at 4,000 ft, it’s a gorgeous view of the country. We were greeted with smiles and hugs by Bob Farley at the airport, and after a quick lunch in Punta Gorda, we headed to the training center to unpack and prepare for the weekend’s pastor’s conference. We worked on teaching prep, gift bags, and cleaning. Thank you to everyone who donated items for the trip! We are looking forward to showering those we encounter with God’s great love! Today Joe and I, along with a team of 6 others, are heading back to the Toledo District in southern Belize. Last October we had the privilege of meeting and partnering in gospel ministry with Bob and Rhonda Farley, missionaries to Belize for over a decade. This region of Belize is the poorest of all the districts, with only 11 of 52 villages having access to electricity. 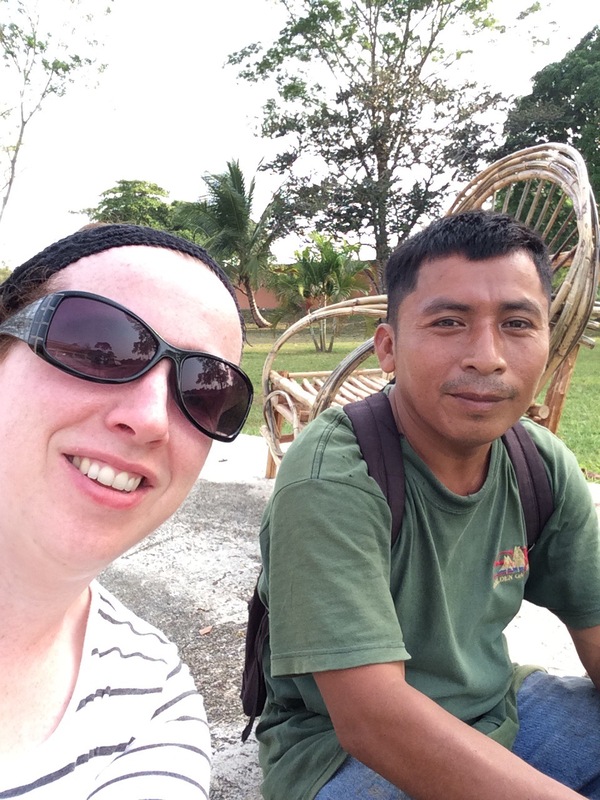 The average worker in Belize makes less than $400 annually. And though the name of Jesus is familiar to Belizeans, their access to spiritual growth resources is very limited as their is no Bible college or seminary in the country to try pastors. That’s where our mission comes in. This week our team will be partnering with the Belize Training Center, which the Farley’s have established near Punta Gorda, to train and disciple pastors and their families. We will bring teaching, encouragement, and counseling in hopes of strengthening and encouraging the faith of our Belizean brothers and sisters in Christ. Would you like to partner with us??? There is a very real spiritual battle going on for the souls of men. We need God to fight for us, in response to the prayers of His people. If you take this calling to prayer and spreading the gospel seriously, would you please commit to partner with us in prayer? For health and safety- pray that God will keep us safe from harm in travel, protection from food borne illness or personal health issues that the team might have. I have a pretty severe cold at the moment. For our team to work in unity. Pray that we will communicate well, encourage one other, and bless one another. For language barriers- that we will be understood regardless of language and cultural differences. Pray that God will provide skilled translators and that what God wants to say to His children will be communicated clearly. For humility- that our hearts will be soft and open to where God’s Spirit is leading us, open to His conviction and His work. Pray that we will not be arrogant or rude, thinking we know it all, but that we will be eager to learn and serve. For us to be uncomfortable- that we will step out of our comfort zones to strike up conversations with nationals, make attempts to learn their languages, worship in a new or different way. For us to be a blessing- both to the Farley family and all the locals we encounter. Pray that our words will be matched with loving actions that draw others to Christ. For our families that we leave behind and entrust to the care of friends and family. Ask God to keep them safe and cover them with His presence. Pray that they would feel included in this process, even if they can’t be physically present with us. Thank you for joining us in prayer!! What a blessing it is to walk this path with you. I look forward to paying pictures and updates as things ice forward.